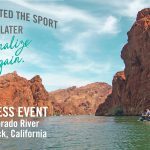 How do you get the attention of boating media editors whom are invited to dozens of incredible press events every year? Produce a disruptive event invitation. To stand out in Public Relations you have to disrupt. The invitation is one of the most important elements of the entire event production. The invitation also sets the tone and expectations of what the attendees will experience. A well crafted and executed invitation can bring your brand to the forefront and set the stage for an epic event. You have to have people attend the event to have an event. Our strategy related to this specific event entailed a custom printed video book with personalized invitation video. 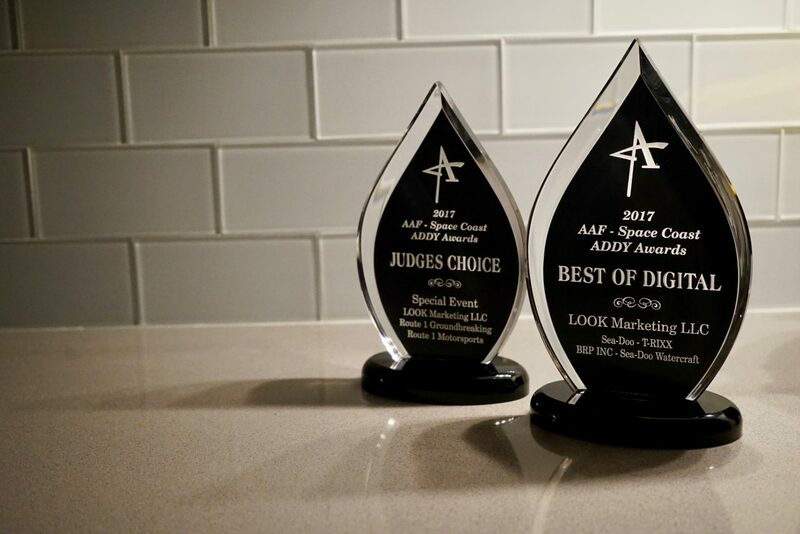 LOOK Marketing received two 2018 ADDY awards from the American Advertising Federation Space Coast Chapter for the production of a Press Event Video Invitation for client Sea-Doo watercraft. The two 2018 ADDY awards received for this project included; Judge’s Choice Award and Gold Addy for the category of Card, Invitation or Announcement. Produce an invitation that disrupts normal in-mail and introduces the brand’s new model year campaign and key messaging. 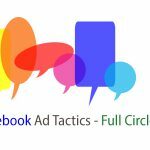 The goal was to create an invite that intrigued and demanded invitees to attend the event and learn about the new product. The Press Event Invitation video book gained immediate attention among media. LOOK Marketing would design a physical, video book invitation that would be sent by express mail to targeted editors. The book visuals would include key message copy and high level event details including location and dates over imagery of the actual event location. 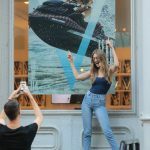 The auto playing video included a brand hype reel and a personal, event invitation message to to engage media through a sensory experience of visual, audio and tactile modes. 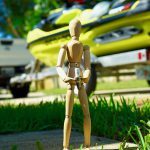 The three sensory modes would work together to help convey Sea-Doo’s 2018 story theme of “Escaping the Everyday” with Sea-Doo. Targeted North American and international marine media and regional vertical and general press received the video invitation. 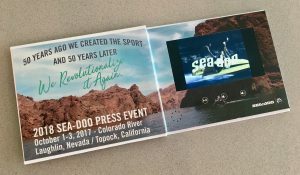 The invitation set the tone for the Sea-Doo “Escape the Everyday” Press Event. 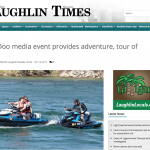 It immediately pulled invitees into the world of Sea-Doo by sharing a unique, adventure-themed video. The video began with auto play when the book was opened. 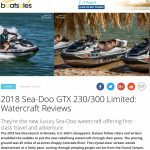 It opened with vintage clips of Sea-Doo watercraft, sharing the news that 2018 marked 50 years of Sea-Doo revolutionizing the personal watercraft industry and followed by teasing the 2018 adventure-ready platforms. ADDY JUDGES CHOICE AWARD – 2018 Sea-Doo Escape the Everyday Press Event Invitation from LOOK Marketing on Vimeo. A glimpse of everyday epic adventures being lived out by Sea-Doo riders around the world would follow the 2018 launch reveal. 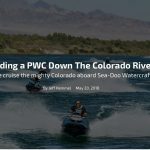 The video then invited them to attend the made-for-media event to experience their own epic adventure on the Colorado River aboard the all-new 2018 Sea-Doo models. 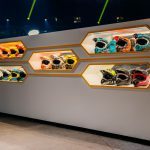 The video invitation culminated with imagery of the natural beauty of the epic event location, and how the PR team would ensure a production and fun event.